Kaku here means a 90° angle, so the various kaku patterns are a string of interlocking or independent right-angles that ultimately form squares. The kaku-tsunagi is a simple pattern that requires skill at fitting miters. In this case, kaku means a "90° angle", so the pattern is a "connection of right-angles". 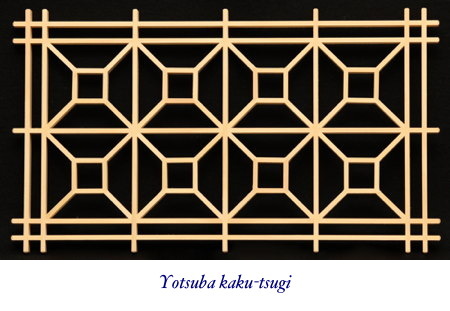 Unlike many other patterns that fit independently into their own squares, this pattern is connected to the jigumi through half-lap joints, and keeping track of where the cuts should be made is perhaps the main difficulty in making it. The futae kaku-tsunagi is a much more complex sibling of the kaku-tsunagi. 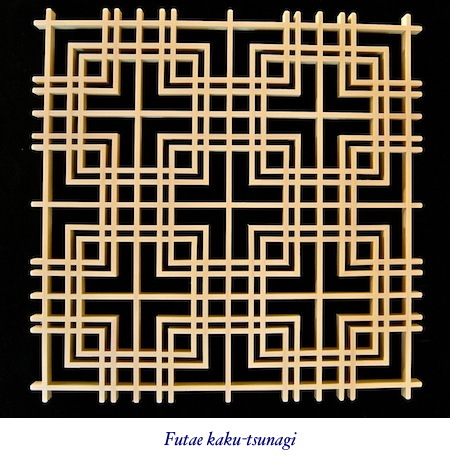 Futae means “double”, so this pattern is a “connection of double right angles”. The pattern can be applied to form a major feature, or it can be reduced in size to form an attractive band or border. The use of timber of different colors within the pattern can also add interest. In this pattern, the squares are not interconnecting, so they sit independently within their own jigumi squares. The pattern itself is quite simple: squares secured in place by four locking pieces with jaguchi joints. 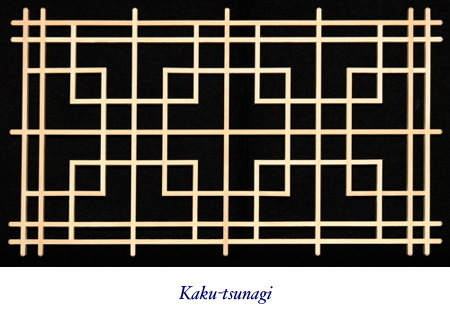 Nonetheless, the squares must line up vertically and horizontally for the pattern to look attractive, and this means that they must be secured in the exact center of the jigumi square, so despite its apparent simplicity, the same amount of care must be given to ensure accuracy as is given to the more complex patterns. 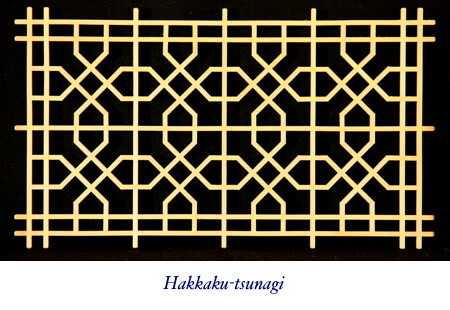 The hakkaku-tsunagi is perhaps one of the more difficult of the kaku family of patterns, not because of the cutting — the individual pieces themselves are quite straightforward—but because of the assembling process. Just the right amount of tension is needed to secure this pattern, and to ensure that the corners line up.